First the bad news: I have to make another muslin. Now the good news: I get to make it in a size smaller!!! Last night I pushed through and finished a down and dirty muslin of S2337. For a refresher, here’s the pic. Since I am making the dress using double-knit fabric, I had the hare-brained idea bright idea to use a stretch fabric. However, did I use a similar knit fabric to what I will actually use for the final dress? NO! I used some leftover fabric that was too stretchy and too thin for this dress. Live and learn, I guess. There is no photographic evidence of this muslin. I know you all want to see how hideous it was, but I was lucky that my camera battery was dead. I made a sz 14 suspecting that I would need to move up to the sz 16 since I have gained weight recently. So in my infinite wisdom, I thought I should sew just 1/2 inch side seams instead of 5/8ths giving me another inch all around. The end result was hideously big. Of course I will need to make another muslin, gratefully in a sz 12 this next time, in real muslin. I think this dress will be flattering once it’s in the right fabric and not giantess-sized, but it’s so hard to tell in its current drapey, stretchy, too big state. I can say with great confidence though that the neckline is Burda low. In fact, I think you could see my belly button from space it’s so low. Not sure how I’ll rectify that yet. Although I am bummed I have to make another muslin, thereby slowing my process down even more, I am glad to have vanity sizing and am excited to work on a new project again. It’s been so long since I worked with a knit, it almost feels like an alien fabric in my hands. I do love the stability of wovens, I have to say. One note re: the drafting. The princess seams on this bodice are a little tricky. The side panel bust curve is really curvy, but the front panel to which it is sewn is not that curvy, so that creates lots of puckers, especially in an unstable fabric like a stretchy knit. I will have to see how it works in a woven fabric first before I decide what method with which to tackle them once I start working with the double-knit. Long story, short: More muslining tonight! Simplicity 2337 won out as my favorite but not for the reasons you might think. Yes, it won yesterday’s poll as the hands down favorite. But, again, that’s not why I chose it. As I was sitting watching zombies last night (love that show), I perused the pattern pieces of the patterns I had on hand, having not received my package from ButtMcVogue yet. So that left me with V8529, S2648, S2337, and B5522. Originally I was just going to go with B5522, because I just adore those sleeves. I decided against that one though ultimately due to the shapelessness of the dress (not wanting to make this a long drawn out muslining process to get a good look and fit) and because I had read on reviews of this pattern that the sleeves are pretty fiddly. I want a somewhat simple and fast project. Someone had made a comment about double-knit not being really drapey. So that took V8529 out of contention as the drape cowl is a major component of the design. I know Carolyn said that it was drapey enough, but I don’t want to chance it. Plus, I don’t like that CF yoke seam. I looked at the pattern piece itself and I can see why they put a CF seam there, but think you can still jigger it to work on the fold. Then I seriously considered S2648 because I just adore the versions that Eugenia made, but two things deterred me. As I mentioned yesterday, it doesn’t have long sleeves and it had many more pattern pieces than the other Simplicity pattern. I know I could stick some other pattern’s sleeves on S2648, but I am not experienced to know if any old sleeve will work with any old armscye. And, again, since I want this to be a relatively painless process before I move on to Xmas gift sewing, I just don’t want to fool with things endlessly. I thought S2337 would be complicated pattern just looking at the pattern envelope. View A (top right) has pleating, a crossover bodice and cuffed sleeves. 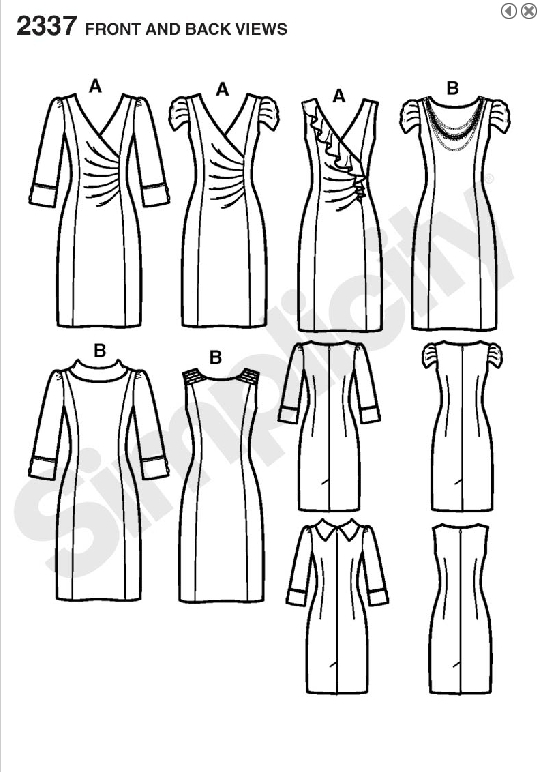 But when I looked at the pattern pieces involved, it’s really a simple dress. I read over the instructions and I didn’t see anything I didn’t understand at first glance, so the simplicity of the pattern (pun intended, hahaha) won me over. My only concern is this is an unlined pattern with facings. I am wondering if I want to line it without facings. Would that be simpler? How do I line the pleated half of the bodice? Should I pleat the pattern piece tissue and make the lining from that? Here’s the line drawing. What do you think I should do? Lining or facings? I think lining is nicer, but it might be a pain to reinvent the wheel. But I am scared that the facings will constantly flip out as I know they are wont to do. *sigh* Nothing is ever cut in dried in sewing, is it? So I cut my muslin last night and am ready to sew it tonight. I cut out a 14, but suspect that I am now a 16. I hope not, but we’ll see.